Brain Tumors- There are basically 2 types; those that originate from the brain and surrounding tissue, or tumors that spread to the brain from somewhere else in the body (metastatic tumors, that is, cancer that has spread/metastasized). People often ask if their tumor is "benign"; benign and malignant are terms used to describe how a tumor looks under the microscope of the pathologist, or refers to how aggressive a tumor may be. However, even a "benign" tumor can grow back and cause serious harm or death (like in the case above where the tumor is pathologically considered benign but was causing blindness). Benign and malignant are not always the best terms to describe brain tumors. Just like in real estate, location is key. Some tumors are in a location where they can be removed with little chance of harming the patient from surgery . Others are in places where even with our current technologies, patients are likely to be harmed by surgery. The role surgery has to play is also not clear in some cases. 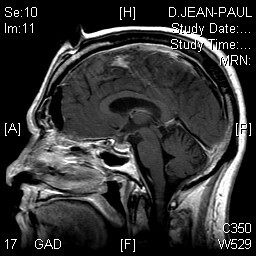 The world of neurosurgery has not shown exactly when observation, biopsy, surgery, radiation, radiosurgery, or chemotherapy is necessary in certain types of tumors. Also, surgeons will impose their own bias when discussing options with patients. For some surgeons, the only option they offer is surgery....however, others, that have unbiased views will be able to discuss the benefits of all the options. For example, in patients with acoustic neuromas less than 1 inch in diameter ( say, about 2 cm), run out the door if the surgeon does not discuss radiosurgery in a positive light and as a viable option. Neurosurgeons and their colleagues in medicine have made HUGE strides. We are using computers now to precisely localize tumors in the operating room and can treat many tumors without surgery at all ! See a board certified neurosurgeon that is comfortable with brain surgery and knows about all the options. Click here for a great link on specific conditions.